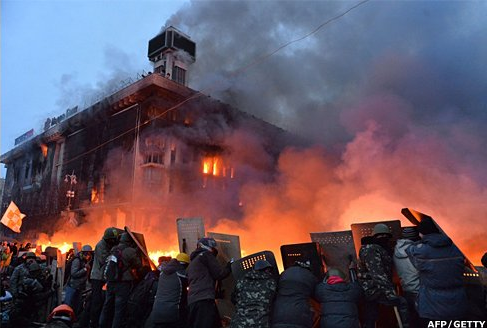 Violence has again erupted in Kiev, the capital of Ukraine, and is reported elsewhere. Clashes between protestors and police are reported to have claimed the lives of at least 14 protestors, 10 police officers and a journalist, with several hundred people injured on both sides. The conflict, which has oscillated between calm and violence for months, escalated dramatically on February 18th, with policemen being shot, and riot police moving in to clear the peaceful protest camp on the city’s Independence Square, called Maidan Square. Please hold all the people in the country, who are profoundly affected by this conflict, in your hearts and practice. You may wish to dedicate a period of practice to all who are caught up in the tragedy, or do specific practices, such as tonglen, for them. Thank you for bringing this world event to our attention and to our practice. The brief truce in Ukraine was shattered Thursday morning, February 20, and the most recent count is that at least 25 protestors have died, and hundreds (including one journalist) have been injured. The proximity of the Ukraine to Russia creates quite a vivid divide in the otherwise helpless mind of a Canadian practitioner; thank you for reminding us to practice for peace for all concerned. Otherwise one is simply seduced by the glittering entertainment of Sochi, and ignores the pain,fire, and violence happening in Kyiv. I do hope the European Union will put sanctions on President Viktor Yanukovych’s corrupt government, and that all Ukrainians will see the dawn of democratic freedoms and human in this coming new year of the Wood Horse!